427 million people will be watching esports by the year 2019. Having already awarded Nosgoth our “Best Multiplayer” award at this years Eurogamer, I wanted to discuss in a little more detail as to why I enjoyed the game so much. I wouldn’t find it at all surprising if you haven’t heard of the game because only the day before Eurogamer did I become aware of its existence. It turns out a few of my friends play it in between SMITE and Hearthstone and they insisted that I track it down at the Expo. I’m really glad I did. I mentioned in my brief summary of Nosgoth that it’s an arena based, mulitplayer action game set in the Legacy of Kain universe. There are two sides of four made up of Humans and Vampires, which go toe to toe in an effort to kill one another. Its premise is basic and the concept is hardly new, yet Psyonix have managed to find a weird niche that’s incredibly appealing. Played from third-person, which itself feels a little strange at first, the game nestles itself somewhere between Team Fortress 2 and Left 4 Dead. Each of the factions has four unique classes that fulfill very different roles. Unlike in Team Fortress 2 where classes are mirrored across the red and blue teams, the Humans and Vampires are totally different to the point where comparisons are impossible. As a result, enforced switching from Humans to Vampires during play requires a massive shift in how you approach the game. I started out by choosing a Human Scout and proceeded to get absolutely annihilated by the opposition. I’ve always played bow based classes but this was a rude awakening. With the ability to stealth as part of my limited action set (I could have swapped this skill out) I still struggled to keep distance and pace when faced with Vampire opposition. Even after going back to the game several times after my play session was finished, I still couldn’t seem to find a groove with the class. It’s clear it hits hard (when I actually hit something) but also relies heavily on your allies keeping Vampires away from you while you deal damage from afar. In contrast, the Hunter, Alchemist and Prophet feel infinitely easier because of the speed at which they attack. Out of all the four Human classes, I have to say that Psyonix have done a really good job in making them feel unique. Although they’re all ranged (where Vampires are all Melee) they feel distinctly different because of their skills, rather than just the weapon they wield. The Hunter has a variety of attacks to trap and snare opposing Vampires while wielding a rapidfire Crossbow, the Alchemist a handcannon that’s capable of firing clusters of grenades quickly and finally the Prophet which uses a pistol and life stealing as a gun toting hybrid. The dynamic element in all the classes is the fact you can only wield three skills at once and all these have relatively lengthy cooldowns. You cannot afford to fire and forget these skills because their power is significant, whether they’re offensive or defensive in nature. It’s evident that the key to a teams success is to ensure that your loadout compliments your teams playstyle and to ignore that will likely cause the death of you and your entire team. I pointed out in my original synopsis of the game that Humans are incredibly powerful when they’re acting as a pack and that still remains true. It might feel odd at first ensuring you all cluster together (still with enough distance between each other so you aren’t a ball) but to not do so, even as ranged classes, will pretty much guarantee your death. The Prophet was the only class that I could comfortably go toe to toe with against a Vampire but even then, that was only possible if I managed to get the drop on them first. Without an ability to jump (I’ll discuss that in more detail shortly) you rely heavily on positioning and dodging. 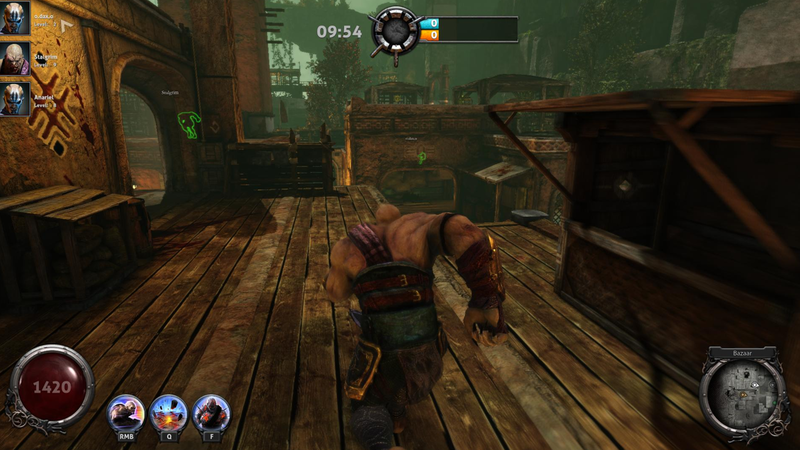 As a third person game, every part of my body wanted to jump in Nosgoth. I don’t know why, but with the amount of massively multiplayer games I’ve played, not being able to jump while looking at my characters backside just felt odd. Surprisingly, I actually got used to the change pretty quickly. I don’t know the reasoning behind why Humans in the Legacy of Kain universe are incapable of jumping (perhaps they’ve weak legs) but for whatever reason Psyonix dreamt up, it does actually work. It works because Vampires are capable of scaling and jumping walls which makes your play as a human feel even more vulnerable. Where Vampires are concerned and as previously mentioned, the fact they’re all melee might initially lead you to think they’re at a huge disadvantage - quite the contrary. Vampires are incredibly powerful because their skills allow them to quickly disperse or incapacitate Humans. For example, the Tyrant (a hulking giant of a Vampire with huge amounts of health and damage) can charge opponents to knock them out the way or smash the ground to stun them. This obviously buys valuable time for other Vampires to leap in and cause absolute mayhem. As far as Vampire variety is concerned, they are highly reminiscent of Left 4 Dead. The Tyrant, as just mentioned, feels a bit like The Tank; the Rever plays almost identical to The Hunter; the Sentinel similarly to the Smoker (in the sense that it incapacitates one player) while the Deceiver a little bit like the Witch or Jockey. It’s not really a bad thing because Psyonix have built upon this template with the Limited Action Set and although the principals of class design are eerily familiar, each class takes on a unique feel. So how does Nosgoth make its money? Well, a bit like Bloodlines Champions it has a lobby and a store. You can chat in the lobby, browse items and classes and decide which game mode to play. If you want to speed up the acquisition of skills or classes, you can buy Runestones which cost around $10 for 2100. You can’t buy a class for that amount (they’re 3,000 Runes) but you can buy lots of skills and boosters. If you don’t want to part with any money you can earn experience as you play and redeem this for upgrades. Fortunately Psyonix haven’t been mean with their model and it’s pretty easy to just unlock items that won’t cost you a penny. Overall then, I’m pretty impressed with Nosgoth. Besides a few less-than-stellar running animations, it’s really solid. My only reservation is the fact that as a game, it might struggle to attract the playerbase it needs because it’s an unknown quantity. I still think they should allow humans to jump and I still think they should make greater use of costumes for classes but and most importantly, I think they should tie in the game more to Legacy of Kain. Perhaps just change the title so it’s clear that this isn’t a new IP. I think that’ll go some way in guaranteeing more players take part in the Beta and its eventual release. To read the latest guides, news, and features you can visit our Bloodline Champions Game Page.